Tucking your shirt into jeans, skirts or trousers isn’t exactly a new phenomenon. In fact, many of us have been doing it since our decidedly les-stylish teenage years. But with high-waisted styles and looser fitting denim now firmly taking the lead over hip-hugging skinnies, tucking in everything from T-shirts and printed blouses to dressy evening tops has become de rigueur. If you missed that memo, however, we’re pretty sure you’ll have caught the Queer Eye stance on the whole thing. Especially since #FrenchTuck has begun trending on Instagram. Since season two of the cult Netflix show aired last year, Google searches for stylist Tan France’s French tuck have skyrocketed—and it's happening all over again with the (may we say EPIC) season three screening on Netflix right now. 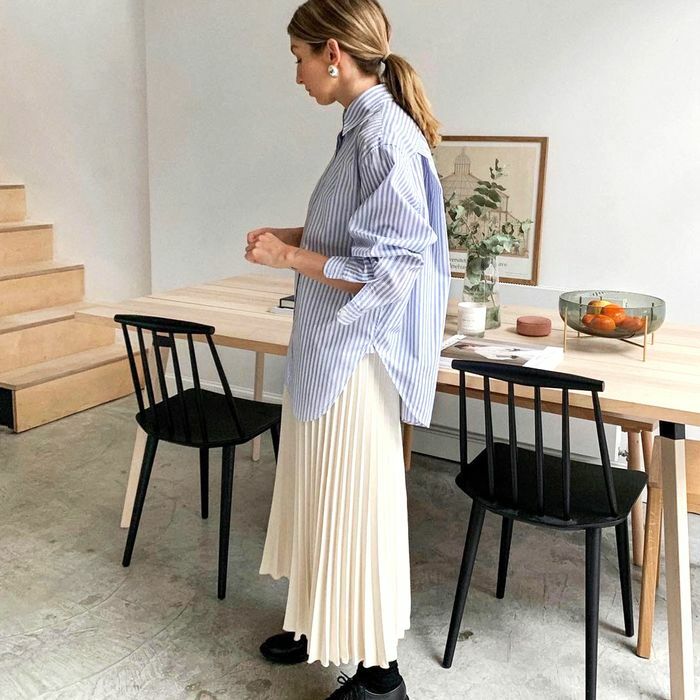 If you’re not yet a fan of the show, the French tuck is simply the art of tucking in a shirt at the very front while leaving the back loose—don't tuck it in at the sides, this is all about an artful front drape. According to France, who sports the look regularly, this simple tucking technique instantly adds polish to any look and can elongate the body too, helping to slim or add balance to your silhouette. It works for both men and women (as you can see, Tan is doing it with his jumper, pictured above), and for different weights of top—you'll find you can French tuck a jumper into jeans or a skirt just as successfully as you can a flimsy, silky blouse. It truly is the styling gift that just keeps on giving. Loving the idea of a French tuck? Keep scrolling to see the most stylish way of tucking in your shirt in action, plus all the shopping options you’ll need to nail the look. Style Notes: A bulky jumper worn long over leather trousers wouldn't be very elongating, so Natasha has wisely used a little French tuck here to keep things chic. Style Notes: The idea works particularly well with this season's slip skirts. Mette does it to perfection with this pink-and-red combination. Style Notes: Everyone's doing it with floaty midis and cute knits, including the blogging duo, Belle & Bunty. Style Notes: This can work really well with a belt when you want to define your waist some more. Style Notes: For a more business-casual approach, try a slim knit and high-waisted tailored trousers, like Tine. Style Notes: The French tuck can make a shirt and pencil skirt seem 100 times more relaxed and cool. Style Notes: A belt will help keep a thick jumper firmly fastened in place. Style Notes: A tonal French tuck outfit like Monikh's always looks incredibly sophisticated. Style Notes: You can be an über-minimalist and an über-maximialist and still lean on this one outfit tweak. Style Notes: With black skinny jeans, this styling move is a total classic. Style Notes: This can be a handy way to wear your favourite items together when usually they wouldn't work—a long jumper over a long slip skirt isn't the best combination unless you French tuck it. Style Notes: When in Paris… Khaoula followed the French tuck rule very nicely here. Style Notes: Don't forget, this is a perfect styling move for boxy tees come summertime. Next up, the best high-street items as seen on Instagram. This story was published at an earlier time and has since been updated.